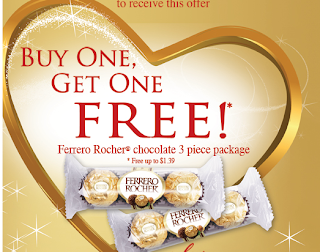 Like the Ferrero Rocher Facebook page to receive a Buy One Get One (BOGO) Free coupon for a 3-pack Ferrero Rocher package. THE FINE PRINT: Limit one coupon per person/per household. Offer valid while supplies last.